The Puri Pavillion was dedicated in October 2011 and will be a welcome shelter to those who enjoy the Peace Plaza. 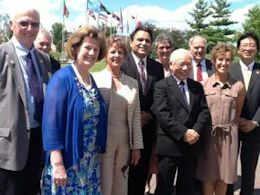 Rotary International President, Sakuji Tanaka visited the Peace Plaza in June 2012. 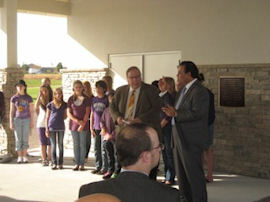 Sunil Puri, Jim and Pam Keeling, and other dignitaries welcome him. 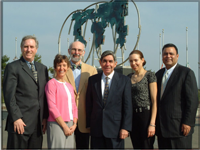 Nobel Peace Prize winner 1987, Dr. Oscar Arias, visits the Peace Plaza in 2014. Dr. Arias is also the former President of Costa Rica. 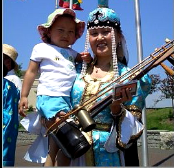 A dedication of the Mongolian flag took place at the Peace Plaza at International Day of Peace 2008. The Rock River Valley community raised over $100,000 for Greg Mortenson’s Pennies for Peace Foundation to build and endow a school for the children of a village in remote Pakistan or Afghanistan. Our community’s involvement, spearheaded by the children, expanded to 50,000 donors and included most of our schools, as well as area businesses and individuals. 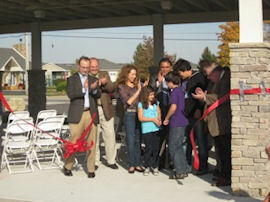 “This project captured the hearts of our children and community. 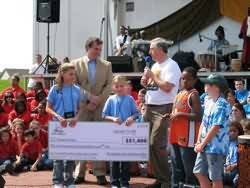 In addition to the lessons of philanthropy and personal responsibility, the Pennies for Peace effort was a gift to ourselves, reminding us of the value of education for everyone in the world as a tool to peace, understanding and success in the future” said Jim Keeling, co-founder of the Keeling-Puri Peace Plaza.